What would you sacrifice to do the right thing? 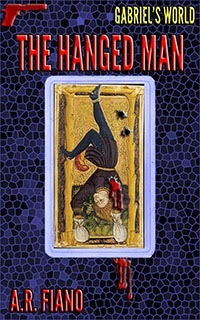 New York City private investigator Gabriel Ross faces this elemental situation in The Hanged Man, the first book in the Gabriel's World Mystery/Thriller/LGBT series. The book opens with Gabriel getting himself out of trouble for hitting a notorious preacher protesting Gabriel's friend's funeral. Although this act has gone viral on YouTube and garnered Gabriel bad press, attorney Raymond Booth is impressed enough hire Gabriel to probe a disturbing incident at Raymond's charitable foundation. As Gabriel is otherwise publicly scorned and losing clients, he's keen to take on Raymond's case. But then Raymond disappears. Now Raymond's troubled sister Toni hires Gabriel to find the missing man. Gabriel turns up evidence of abduction--and then Raymond turns up dead. Gabriel's case is over, but he isn't finished with it. He continues investigating the into the mystery Raymond wanted him to solve. Gabriel has help from journalist Alex Barclay, a potential new love. But Gabriel's former boyfriend Joel has come back to the city to help Gabriel, leading to complications in Gabriel's personal life. Gabriel begins unraveling a sinister secret connected to the foundation-a cabal tracing back to the origins of Nazism. Gabriel endeavors to uncover the conspiracy of Raymond's murder without losing his license, freedom, or life. The second book in the series is Two-Faced Woman, also featured on GoodKindles.